I bought this dress yesterday in H&M and I really love it, i've been looking for a black and white striped dress for a while and this one was only £12.99 and fits really nicely. I've teamed it with the black Dr Marten style shoes I featured on my bargain wish list post which I am totally in love with and can't believe they only cost £10! I really like the monochrome look and this hat is covering my horrific hair which is being dyed this afternoon, so look out tomorrow for my super silver hair! I have to get myself to H&M at the weekend that dress is fab and a bargain. Your dress is great! Love it! 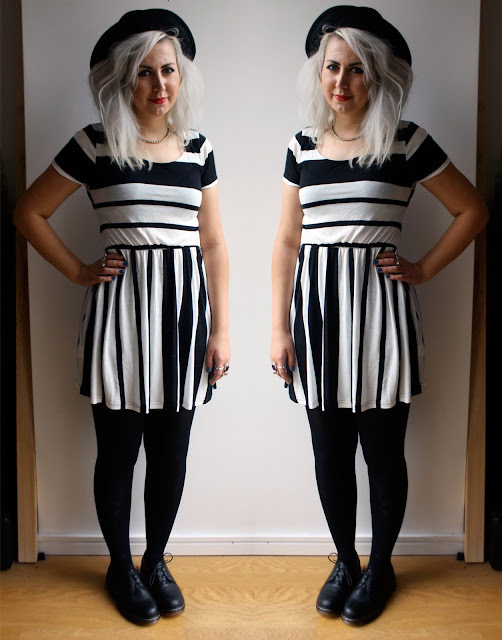 LOVE this dress, you can;t go wrong with monochrome! Blogger of the Month: The Robyn Diaries!